In the five years of writing this blog, pretty much every single post has been accompanied by a writing sample of some sorts. Except for the very early ones, I've consistently used Rhodia paper for every written review. It's not rocket science to figure out why I am so loyal to their products: their paper is affordable, widely available, and the quality is about as good as it gets. The only downside is that the Rhodia notepads are generally quite boring in terms of design. You can get them in either black or orange, and that's about it. Last year they released a set of special edition notebooks, called 'Heritage': a collection of cahiers, notebooks and writing pads with some much needed printed designs to liven up the covers. I received two No. 16 (A5-sized) writing pads from the kind folks over at Papier&Stift to try out a while ago. As I said, they are supposed to be special edition, but we're about one year later and most of the products are still easily available through various retailers, so I suppose they will stick around for a while longer. The cover of the Heritage writing pad is made of a white matte cardboard stock. The covers are embellished with retro-inspired prints... you guessed it: in black and orange! They still hold true to the original, but with just enough change to keep things fresh. The refreshed covers are a nice and welcome change, but the important part is how it performs of course! On the inside, you'll find -once more- that Rhodia knows how to provide excellent paper. The 90gsm vellum paper is slightly thicker than that found in the regular pads (80gsm). While the 80gsm paper handles ink good enough, the extra weight gives the paper a more quality feel. The paper is an off-white ivory color, which is usually not something I would choose because inks will obviously not come across very color accurate. However, the Heritage pad combines it nicely with vibrant but unobtrusive orange ruling (this particular one is lined, but a grid version is also available), which makes for a rather unique paper that is quite enjoyable to write on. I have a strong suspicion that this paper is actually the same paper that's used in the Rhodia R writing pads, but I haven't actually tried them side by side yet so don't take my word for it. Sheen comes through, but it's no match for Tomoe River. The ivory color gives your writing a warm glow, and it's exceptionally good at bringing out shading. Sheen comes across slightly better too, but once you tried Tomoe River you'll know what REAL sheen is (nevertheless it's quite good on this paper too, though). The orange ruling does a great job at providing guidance while you write, yet it's not very obtrusive on a finished page. Writing looks crisp and vibrant. The thicker paper helps a lot in terms of showtrough, which is something the standard Rhodia paper sometimes struggles with. Unsurprisingly, bleedthrough is not an issue here, but neither is it on the 80gsm paper. If one thing, I wouldn't recommend it for use with pencil as you'd be better of searching for paper that has a bit more tooth to it. 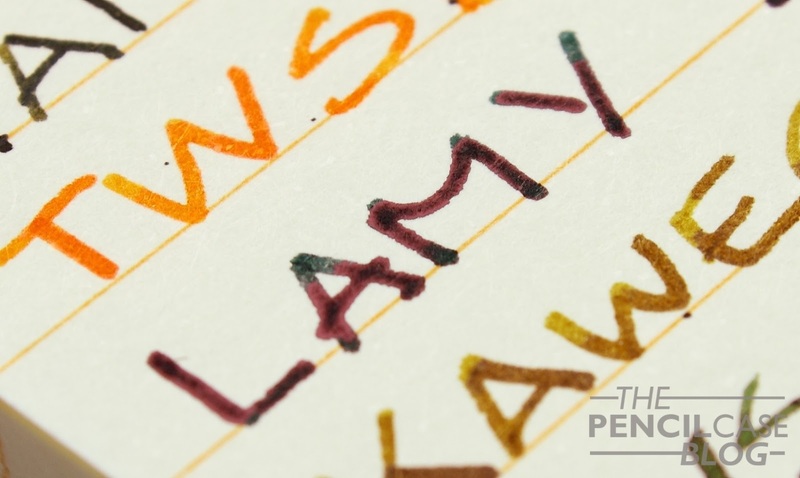 Certain types of ballpen/rollerball refills can also be more prone to smudging. Rhodia paper is loved by so many for two simple reasons: it's excellent paper that not many brands can match, and it's cheap! At 4.95 EUR (via Papier&Stift), the Heritage collection doesn't deviate from the formula: good quality paper at an affordable price point. If you never tried Rhodia paper before, the Heritage writing pad would be a nice place to start. If you're already familiar with the brand, these won't dissapoint. The design is simple and clean -in true Rhodia fashion- with a more playful look. But the real star of the show is the excellent paper of course. This product was sent to me by Papier&Stift so I could write this review. I was in no way influenced in the making of this review, the opinions shared in this review are completely my own! This post does not contain affilate links.